The Freeport Parks Foundation has several on-going projects to enhance the parks and green space for the community in a sustainable approach. In 2009 the Freeport Parks Foundation launched a campaign to assist the Park District to reshape the Commissioner’s Garden. 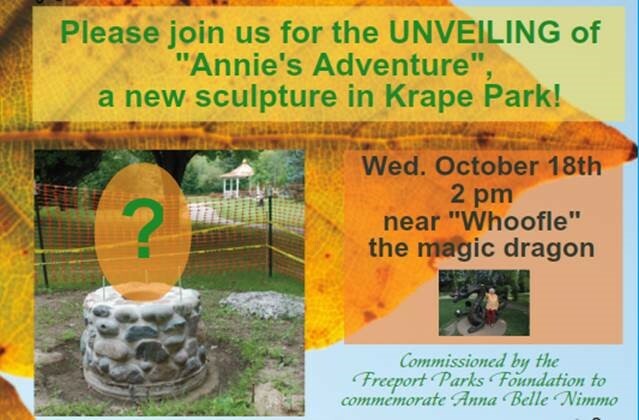 Several citizens of Freeport donated trees and shrubs for the landscaping around the magical Whoofle Dragon sculpture, a gazebo was gifted for musical events (and it serves as a backdrop for photos), historical gates were donated, and much more was contributed for this on-going project. Plaques honoring all past Freeport commissioners will be placed on the stone pillars lining the walkway into the garden area. Ash trees in Stephenson County are in jeopardy. The emerald ash borer (EAB, a green beetle that kills Ash trees), is a beetle native to Russia, China, Japan, and Korea. Most likely it was transported from those countries to the U.S. in crates or in wood used for stabilizing cargo ships (ballast). The beetle was detected in Chicago (among other US cities) in 2002 and has slowly been migrating west. It has been detected in Winnebago county and most recently (September 2013) in Jo Davies County. Outside its native region, the emerald ash borer is an invasive species, and its infestation is highly destructive to ash trees. The Freeport Park District has over 500 ash trees in various parks that will likely perish due to the beetle in the next 3-5 years. Over 100 trees that were already relatively old were removed in 2013. The Freeport Parks Foundation is taking an active role in helping offset some of the tree removal and replacement costs. Funds raised at events such as the Oakdale Autumn Leaf Trail Run/Hike will go directly to help the park district purchase a wide variety of native trees to be planted where ash trees once grew. A tree replanting activity is planned in spring 2014. The Freeport Parks Foundation in collaboration with the City of Freeport is changing its urban forestry management to become compliant with and submit an application for becoming a member of the “Tree City USA” program. This national program developed by the Arbor Day Foundation Program provides a framework for community forestry management for cities across America. Communities achieve Tree City USA status by meeting four core standards of sound urban forestry management: maintaining a tree board or department, having a community tree ordinance, spending at least $2 per capita on urban forestry and celebrating Arbor Day. The program brings together the community and inspires citizens to plant, celebrate, and nurture trees in a sustainable approach. The Freeport Park District offers many ways to recognize life’s many occasions…births, anniversaries, retirement, the loss of a loved one…the list is endless. The Freeport Parks Foundation can assist you with honoring these moments with the gift of a park bench or tree for placement in a park or facility. An inscribed plaque accompanies each gift and a portion of each donation is set aside to provide even more trees, benches and more amenities in the future. While staff attempts to honor the donor’s location request, some sites are not appropriate for placement due to development activity, space considerations or density saturation. Staff is happy to recommend sites where these amenities are most needed to enhance the natural beauty of the entire park system. Trees benefit people, wildlife and the environment. They clean the air we breathe, absorb contaminants out of water, slow rain water runoff, shade houses lowering electric demand, increase home value and absorb sounds making our streets quieter. Gifts of $500 or more will be recognized with the planting of a tree. Trees may be requested at any time. However, installation takes place twice annually, the Spring and Fall. Since trees are living organisms the Park District guarantees trees for a period of seven years. So that other park patrons may enjoy the park’s natural beauty, decorating trees is prohibited. The intent of the Park District is to maintain these trees for their entire life span, but longevity of plants varies by species, environmental conditions and change. While we try to adhere to a long range plan, organizations like the Freeport Park District continually adjust to changes in society and the needs and wishes of our constituents. For a gift of $1,500, the Freeport Park District will assists the donor to find the most suitable location for a durable, attractive 6ft. park bench made of recycled polyethylene slats and cast iron stanchions. These benches are guaranteed for seven years. For more information about these and other memorial opportunities, please contact the Freeport Park District at 815-235-6114. The destiny of the beloved Totem Pole that once welcomed the community at the main entrance of Krape Park is being discussed, with input from the community sought on the final journey of the Totem Pole, and possible replacement options. Stay tuned for more information, or – better yet – voice your opinion by contacting 815-232-4600.